Sixkiller, the great-grandson of a Cherokee Indian chief, was blessed with a fabulous arm, and coach Jim Owens decided to use it, turning the Huskies from a running team to a passing team. Sixkiller threw for a school record 2,303 yards as a sophomore, ninth best in the country. We could argue for hours over who is the greatest Husky football player. 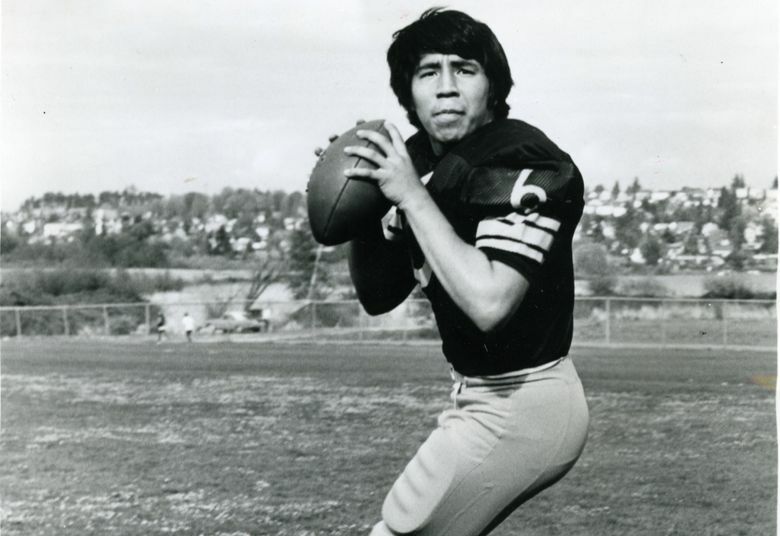 It’s hard to argue against quarterback Sonny Sixkiller, who captivated the city from 1970-72. The Seattle Pilots had just left town, and it would be years before the Mariners and Seahawks arrived. The Sonics were just a few years old, and still struggling. The University of Washington football team was moribund, coming off a season in which it was 1-9 and averaged 11.6 points a game, 110th of 122 teams in the country. Then came Sixkiller. He not only elevated UW, but the region. Soon, it seemed, everyone had a No. 6 UW jersey. Sixkiller, the great-grandson of a Cherokee Indian chief, was blessed with a gifted arm, and coach Jim Owens decided to use it, turning the Huskies from a running team to a passing team. Sixkiller threw for a school record 2,303 yards as a sophomore, ninth best in the country, helping Washington to a 6-4 record. Suddenly, UW football was fun again as the Huskies averaged 33.4 points per game. Ready or not, Sixkiller was a big star — at 19. Sixkiller, now 67, had no idea what was coming after graduating from Ashland High School in 1969. At 5 feet 10½ and 155 pounds, he was lightly recruited. Oregon State wasn’t interested because he was too small. Southern Oregon in Ashland wanted him badly, but when the Huskies offered a scholarship, he decided to come north. The starting quarterback, Gene Willis, injured his knee, moving Sixkiller to No. 2 on the depth chart. When the new starter, Greg Collins, broke his collarbone early in the spring game against the alumni, “I was the only one left,” Sixkiller said. He came in and started throwing. And throwing. He threw 50 times, completing 24 for 387 yards and a touchdown, leading a 43-7 win over the alumni. Sixkiller quickly proved that the spring game was no fluke, leading UW to a 42-16 season-opening win over favored Michigan State at Husky Stadium, throwing for 276 yards while the offense had 598, its most in more than two decades. He ended the season throwing for 256 yards in a 43-25 win over WSU in the Apple Cup, one of two times he led the Huskies to a win over their rival, giving UW its first winning record since finishing 6-4 in 1966. Jim Krieg, a JC transfer, caught a team record 54 passes that season. But leading the way was the new quarterback, who to this day likes to spread the credit around. Sixkiller’s star power grew. He led UW to an 8-3 record as a junior in 1971, throwing for 2,068 yards and earning a spot on the cover of Sports Illustrated. He was not only representing the state, he was perhaps the most recognized Native American athlete since Jim Thorpe. Sixkiller missed three games with a pair of injuries as a senior, but still led the Huskies to an 8-3 record and threw for 1,125 yards. He left with nearly every UW passing record and still ranks No. 8 in career passing yards (5,818 yards). His 16.4 yards per completion in 1971 is still a school record. Sixkiller was not selected in the 1973 NFL draft, his lack of size scaring off teams, but he played two seasons in the World Football League before it folded. In 1974, he played the character Tannen in the classic, “The Longest Yard,” starring Burt Reynolds. Sixkiller made a smooth transition into the business world, spending much of the past four decades in sales, including selling ads for Husky radio broadcasts. He is currently the associate general manager at Washington IMG Sports, the official network of Husky sports. He and wife Denise have been married for 44 years and live in Seattle. They have three adult sons and seven grandkids. It has been nearly 50 years since Sixkiller’s heady days at Washington, a time in his life that that he still treasures.